Finally! Preparing for the write-up of this chapter took some time as I really wanted to be able to comment on it from a bounty hunter's point of view as well, which meant dragging another alt through KotFE. I do think it was worth it though. Without further ado, let's jump right in! As usual, there will be spoilers. Click here to go back to Chapter 12. 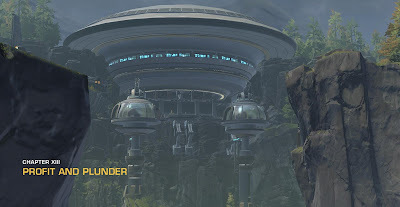 For the third time in a row, the intro screen is an outside view of Odessen base, because clearly Bioware is worried that a month between chapters might be enough time for us to forget where we are. Chapter 12 ended with a massive cliffhanger, with both Kaliyo and Havoc Squad having gone MIA while on a mission on Zakuul that could make all the difference in the fight against Arcann. Chapter 13 decides to not immediately resolve this, as you are told that everything within a kilometre of the Spire has been locked down and there is absolutely nothing you can do about this. 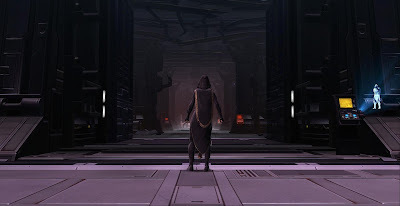 Never mind that you've been traipsing around Zakuul right under Arcann's nose in no less than three previous chapters... this time, it's suddenly completely impossible to do anything at all to help your companions. Sorry! And now for something completely different: Hylo Visz wants to speak to you. She awaits you in the military hangar - come on, guys, you're not allowed to leave your respective "zones"; it's confusing! Hylo tells you that the Alliance is strapped for cash and that she wants you to meet a contact who might be able to help with that. You find him at the sabacc table, where he's just beaten Lana at the game, apparently by managing to cheat even the former minister of Sith Intelligence. It's Gault, the infamous former bounty hunter companion. As a bounty hunter, this reunion is filled with some great and hilarious lines of deadpan humour. Otherwise, Hylo just introduces him as an "untrustworthy scoundrel". Gault outlines his plan to fund the Alliance: It involves raiding the Gilded Star, the Eternal Empire's top secret flying treasury, which is supposed to contain the largest collection of wealth "since the Hutt Empire was a thing". He's come to you because he can't execute his plan alone, and all he wants is his fair share of the loot. 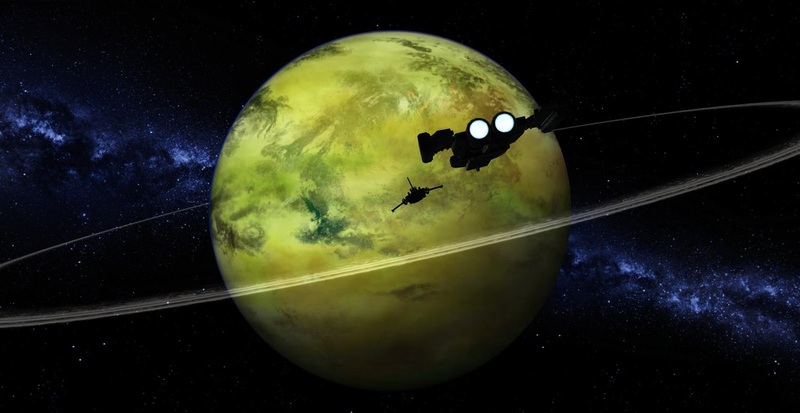 You agree that this sounds like a good deal, which soon has Gault taking you and a few select companions to the gas giant Vandin, where the Gilded Star is hiding and some last preparations need to be made. First you need to hunt down the last member of Gault's "crew", an Anomid identity forger called Dretcher, who previously created the body double that allowed Gault to join the bounty hunter's crew. Dretcher has been living the life of a hermit inside a shipping container ever since a falling-out with Gault ruined his reputation and got him in trouble, but Gault has relocated his "home" to Vandin and wants him to come back out to work with you. Initially Dretcher is very hostile, siccing some droids on you, but after you dispatch them with ease he is forced to listen to what you have to say. You can either convince him in a peaceful manner or threaten to kill him inside his container while making Wookiee noises. After successfully recruiting Dretcher, your next stop is a gang of Nikto pirates from whom Gault wants to buy a giant missile. Except he actually needs only the missile's warhead and wants to haggle about the price because of this. When the Nikto pull their guns on him, he activates the missile's launch sequence. As it starts its countdown to destruction in a high-pitched female voice that many players will find familiar, the pirates make a run for it. Gault tries to abort the launch sequence right afterwards, but it doesn't seem to be working. After a few seconds of panic, a hatch on top of the missile pops open and out comes Vette, laughing about her brilliant joke and carrying the warhead. Gault introduces her as his partner in crime. If you're a Sith Warrior, there is a brief moment of mutual surprised recognition before she walks off - unless you romanced her, in which case she will tell Gault to beat it and be by your side for the next bit instead of Gault. The fleeing pirates triggered a security lockdown which you have to lift again by stealing security spikes from droids. As a bonus mission you can also take out various members of the Nikto's "Brekken Gang" while doing so. Once that's all done, you reunite with Vette/Gault and your other companions, as Gault explains the actual details of his plan. The Gilded Star usually hides in the lower atmosphere of Vandin but has to come up for resupply once a year, which is when you intend to strike. 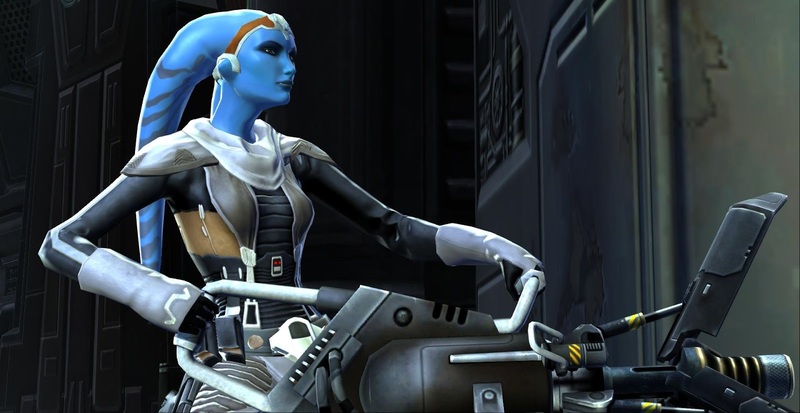 Senya opines that it's too heavily guarded to infiltrate and reveals that overseeing its security was once among her own duties. 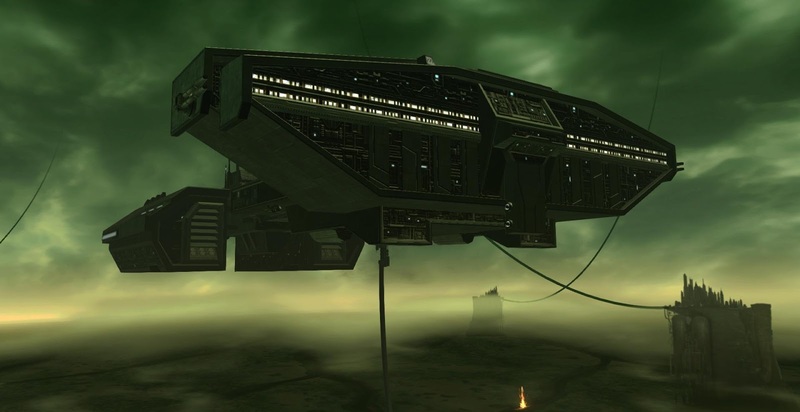 Gault has a special plan for infiltration though: As a close genetic match, Senya is supposed to pose as Vaylin with the help of Dretcher and help Scorpio get to the bridge so she can take control of the ship. (One has to wonder how Gault knows about Senya and Vaylin's special relationship as it isn't generally treated as common knowledge.) Once that's done, the Outlander is supposed to follow with Vette and Gault, with Vette climbing into the guts of the ship to manually disable the vault's locks. Gault will then deposit the warhead inside the vault and use it to vaporise the contents (since the vault is designed to withstand huge explosions from the outside, it also works from the inside), so they can then easily be hoovered up by a tanker that Lana is supposed to connect to the ship. Then you "just" have to make a run for it before anyone has time to really react to the explosion. After this talk, Sith warriors get a chance for a brief heart-to-heart with Vette (romantic if applicable) and bounty hunters get a chance to talk to Gault. On my female Sith warrior I found Vette to be strangely apologetic about the joke with the missile as well as for not trying harder to find me. You can reassure her that it's OK or be mean about it all. I couldn't find any footage of it, but apparently this bit of conversation even considers if you took the shock collar off during the class story, and if you didn't, she'll basically hate you. On a bounty hunter, Gault tells you how your companions spent quite some time searching for you after your disappearance (even that "tumor" Skadge, as he refers to him), but eventually it just seemed pointless. Personally I liked how there was acknowledgement here of how Mako and Torian had become a couple in my bounty hunter's class story. The next day, you watch the Gilded Star emerge from the clouds with Gault and Vette. You can have a fun little side conversation here, quizzing Gault about how he beat Lana at sabacc (which I missed the first couple of times since I never chose that particular conversation option). Scorpio and Senya (disguised as Vaylin) start the infiltration process as planned. As soon as they hold the bridge, you follow with Gault and Vette, both of whom will fight by your side at once for most of the rest of the chapter. Having two companions out at the same time is pretty neat. Scorpio promises to keep reinforcements off your back but you do have to dispose of some skytroopers and ship personnel on the way. You find a panel that allows Vette to climb into the ship's insides to disable the vault mechanism while you continue clearing a path for Gault. Once you reach the vault, Vette manages to open the door for you and it does indeed contain incredible riches, mostly in bar form. You plant and detonate the warhead as planned and Lana shows up with the tanker to hoover up the vaporised goods. As the explosion hasn't gone unnoticed and Scorpio and Senya need to vacate the bridge, it's time for you to make a run for it. Vette rejoins you with a giant assault cannon that she picked up on the way and which she has fondly named "Spewy". You repeatedly have to take detours to get around closing blast doors, and when you finally reach the sky hook, you can't take it because the lift's already busy... with Vaylin in it. What is it with this woman and always showing up in the wrong place at the wrong time? Gault declares that it's time for "Plan B": run and hope for a Plan C. Specifically he's hoping to scale the sky hook's exterior. So you run back into the ship, looking to exit it at another point. After fighting off a skytrooper mini boss who has that annoying mechanic of repeatedly becoming immune to all damage until you've killed off half a zillion weak adds, you get cornered and Gault declares Plan C to be "jump". You take a leap of faith off the ship and land on top of a shuttle piloted by Hylo, who has come to your rescue. Hylo and Gault kiss afterwards, finally revealing to non-bounty hunter characters that they are an item. Vaylin is shown arriving on the Gilded Star, infuriated to have been too late once again, though at least you surely weren't able to achieve much in the time you were there... the moment when she opens the vault and finds it destroyed and empty is priceless. Back on Odessen, it's time to divide the spoils. Hylo confirms that it's way more than the Alliance needs, so you can opt to use it expand, be charitable with it or give some to Gault for an "investment". Both Gault and Vette state that they would like to hang around and everyone gets ready to party when Theron receives a call that Aric Jorgan and Kaliyo have returned. You meet them in the hangar... along with a bunch of coffins draped in Republic flags. Kaliyo and Aric are arguing about whose fault it was that the mission failed and that four people died (as new Havoc had five members next to Jorgan, one has to wonder who's the one person that got away). The best they managed to do was grab a datacore with more information about the droids before they escaped. This can go a bunch of different ways. You can act calm, say that you're glad that at least the two of them are alive or you can rage at them for making a mess of things. If whoever went in second did so against your direct orders, Theron points out that they need to be punished for disobedience. You can dish out a variety of punishments ranging from putting both of them on clean-up duty, to exile, to actually killing one of them personally. I watched some videos of this, as one of the few characters on which I could actually imagine killing Kaliyo hadn't ordered her to stand down (and the killing is only an option if she disobeyed a direct order). It's extra harsh if the one you kill was a love interest before! 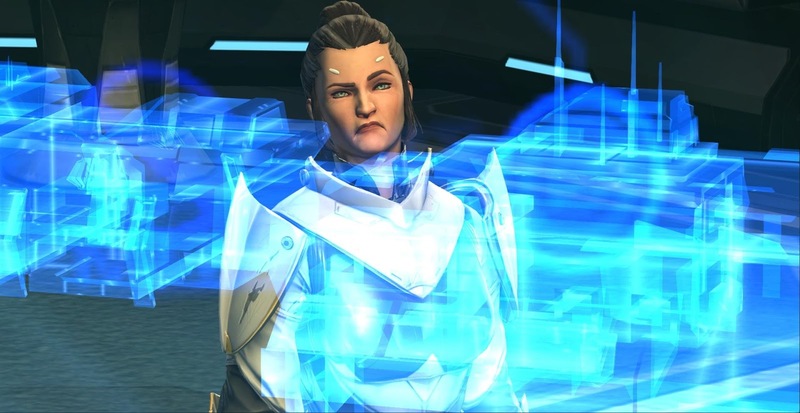 We close with another view of the Eternal Throne, where Vaylin is fantasizing about torturing Senya before killing her, angry about how weak the loss of the treasury must make them look. For once Arcann seems more pensive, remembering their mother as she used to be and not too bothered by the theft, as he is convinced that he's still fearsome enough as it is. This chapter was easily the most well-received so far on release, to the point that even the commenters on Dulfy had good things to say about it. It's easy to see why though - after all it features the return of one of the game's most popular companions: Vette. Gault isn't quite as popular, among other reasons because of the flaws in his "acquisition story", but once you got over that I always considered him to be very fun to have around. More than anything though, the two characters make a great team, making for a chapter sprinkled with clever and amusing dialogue and one that's just plain fun to play through. On top of that, both warriors and bounty hunters will encounter some satisfying references to their class stories here. The ending also has the potential to deliver quite an emotional punch, based on your previous dialogue choices. You haven't seen heart-breaking until you've seen a female trooper execute her husband! However, in the end none of those things detract from the chapter in a major way, and it's undoubtedly one of the more solid pieces of content we've seen added to the game since KotFE. As for Gault knowing about Senya and Vaylin, I'd just attribute this to Gault being Gault. He knows ways to know things that very few other people know (notably he always knows Dretcher's new identities) and this is probably just another one. Now if everyone you meet suddenly knew Senya and Vaylin were related, this would be a very different story! I agree that it's not that strange that Gault knows, considering that he and Vette also know a whole bunch of other things they aren't supposed to know. I just found it a bit surprising with how much nonchalance the subject is discussed and that nobody comments on it.